Washing some of your clothes by hand is quick, easy, and takes an enormous pressure off your weekly laundry machine loads. You’ll be surprised to learn that a bucket sized load takes only 5 minutes when done right. 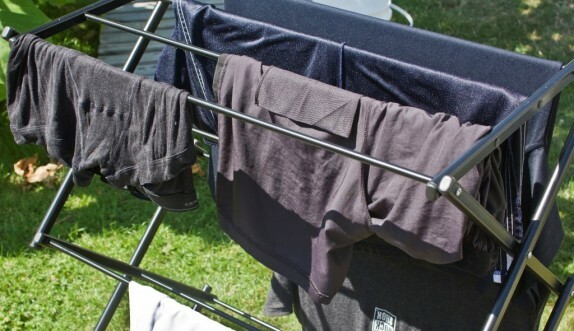 During the summer we manage to handwash at least half our clothing, during the winter we hand wash less because colder weather means everything takes longer to dry and winter fabrics tend to be thicker. Remember that an ordinary washing machine has a “spin cycle” that leaves clothes quite dry. The best you can do with your bare hands is to wring clothes out. Since you can’t get as much moisture out this way, hand washing isn’t practical for all garments. I hand wash clothes that are smelly from body odor but not dirty and made from a quick-drying material, which in most cases just means not cotton. Activewear is a perfect candidate for a quick hand wash. Underwear, although normally made from slow-drying cotton, is thin and dries quickly enough. Jeans, terrycloth, blankets, and winter wear are better washed with overpowered machinery. You should already own everything you need for an easy hand washing. A bucket, any size will do but I prefer a shorter 2.5 gallon so agitating is easier. An agitator. You can use your hands but a tall mason jar works too. Laundry soap. Doesn’t matter what kind and you don’t need much at all. A drying rack or line. In a pinch you can hang clothes on furniture or doors. Important update: A reader notes that ordinary laundry soap can shorten the lifespan of synthetic activewear. He recommends a type of laundry detergent called “Sport-Wash” to keep activewear threads holding together longer. 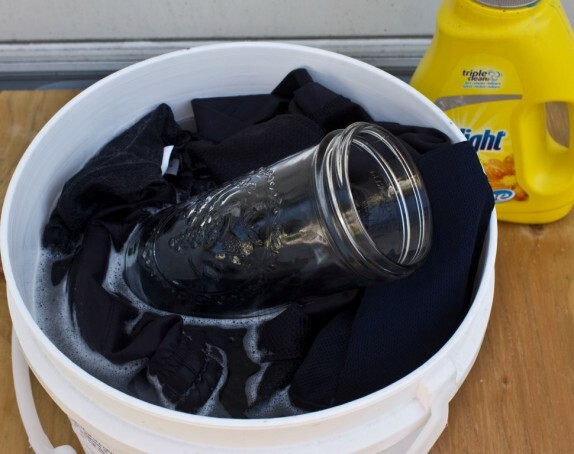 Load your clothes into a clean bucket and add a small amount of soap. Fill your bucket up to the top of your clothing from the tap or hose. Clean your clothes by agitating them around. 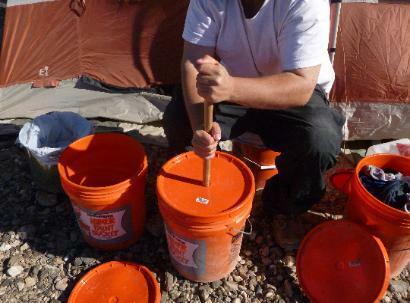 You can use a mason jar, your hands, or just pop a lid on your bucket and roll it down a hill. You can get creative – I’ve heard of people loading their laundry in their car, and using the jostling from their morning commute to shake it around. Washing clothes that are smelly but not dirty only takes about 3 minutes. Dump wash water and refill with rinse water. Agitate again for about 1 minute to rinse the soap out. Hand wring each garment separately to remove as much water as possible without damaging the clothes. Line dry in a sunny or breezy spot. Non-cotton clothes take only a couple hours to dry completely; thin cotton clothing a little longer. Heavy cotton such as denim or terrycloth can take days and is best done with conventional washer and dryer. With a few more parts you can build an easy 5 gallon bucket manual washing machine which will wash clothes faster. If you have more than a few clothes to get through it can save a lot of time to build one yourself. See our 5 gallon bucket washing machine article for more details. I used this idea/design camping this past summer. Worked like a charm… sitting around the fire doing nothing, I put the down time to use plunging my clothes! Lowe’s sells a water/air tight universal lid that comes in a variety of colors for 2.5-7 gallon buckets for around $7. The idea you show is missing the key element, Agitation. The original idea used a 6 gallon wide mouth screw lid bucket (with seal) used for pickles. A cradle and handle are made for spinning/turning it from it’s side center point. It was such a good idea, especially for travelers, someone came out with a commercially available one called the Wonder Washer. 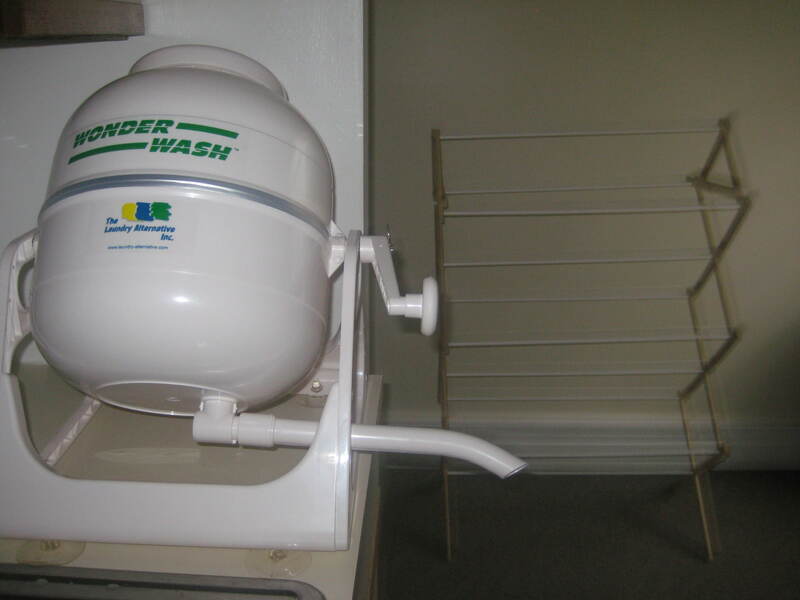 Here’s a pic of the Wonder Washer to give you the idea of how the original was made. Making one from the 6gal plastic pickle jar (found at wholesalers) or a five gallon bucket, is easy. Correction, it’s Home Depot that carries those water/air sealed lids for 2.5-7 gallon buckets mentioned above. When I was deployed, this is how we did our laundry out in the desert. 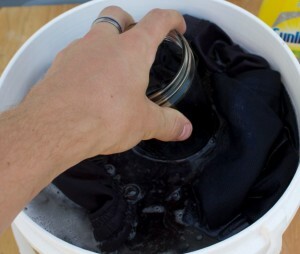 For a great spin cycle, transfer wet clothing into a handled bucket that you have previously drilled with many holes. hold bucket by handle and spin back and forth. It will work like your washing machine does on its spin cycle ejecting the extra water. Of course this is best on hot summer days and when wearing shorts.